Sigh. This book. Great title, great subtitle, I wish the content had delivered. Unfortunately I am no closer to telling you why we expect more from technology & less from each other than I was before I read this book. 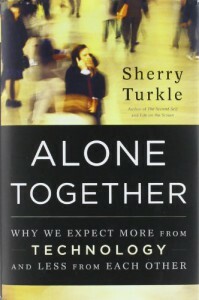 One of the main things that bothered me about this book was that, even though I was really interested in these issues, Turkle did not argue her points very well or very strongly. She only very briefly touches on why we should be concerned about the phenomena of "being connected" in the first place. She doesn't talk about deaths, injuries, and collisions caused by texting & driving, which is a HUGE problem. All her "research" into the way it changes relationships between friends and family members is anecdotal and shows me pretty much nothing. She only barely--and I do mean barely, maybe two sentences in hundreds of pages--touches on the changes in brain chemistry that takes place when a person is engaged with a screen. Instead she has paragraph after paragraph, chapter after chapter of what this kid said about his Furby, what THIS kid said about HER Furby, what THIS OTHER KID said about THEIR Furby, what this kid said about her Tamagotchi, what THIS kid says about HIS Tamagotchi, what THIS OTHER KID said about THEIR Tomagatchi, what this senior citizen said about My Real Baby, what THIS senior said about My Real Baby, what THIS OTHER SENIOR said about My Real Baby. Seriously. That is what the first half of this book consists of. The second half consists of "this is how this teenager runs her Facebook profile, this is how THIS teenager runs HIS Facebook profile, this is how THIS OTHER TEENAGER runs THEIR Facebook profile!!" It's honestly not a boring read at all, I enjoyed it, but eventually I did remember what this book is supposed to be about. It's really a shame because there are many times that she raises some really important and thought-provoking questions. And then leaves them there unexamined. The "research" she does do is dubious. She says, "I find people willing to seriously consider robots not only as pets but as potential friends, confidants, and even romantic partners." Yeah and I can find people who think alligators built the pyramids if I know where to look. What she claims is widespread she doesn't back up with any statistics or studies, and from my own anecdotal experiences, the whole "robot as friend/romantic partner" fantasy is not at all widespread or commonplace. And I'll point out that I don't work at MIT or go to robotics conferences so my experience may be the more mainstream of the two. Maybe she finds people willing to consider robots as potential friends because she is asking them to do so. Hell, I think robots are pointless and they basically hold zero interest for me (also I think it's sort of unethical to put so much time and money and support behind them when there are actual people and actual animals that are starving and suffering to death--but I feel that way about a LOT of things, not just robots), and I would consider the question of robots as friends if somebody asked me to. I mean, you ask people to consider robots as friends and romantic partners and then you're like "OMG THEY WERE WILLING TO CONSIDER A ROBOT AS A FRIEND!!!!!!"? Why would you even do that? I stuck about 200 page markers in this book and I could go on for a lot longer, but I will say, in Turkle's defence, that only about half of them are things I took issue with. She made a lot of assumptions I didn't agree with and she didn't support her thesis to my satisfaction, but like I say, she does raise some important questions. The writing is engaging and fun to read. I'm glad I read the book but I wish it had lived up to its promises.